A fantastic pair of vintage bar / kitchen stools by Tim Behrens for Shlubach. 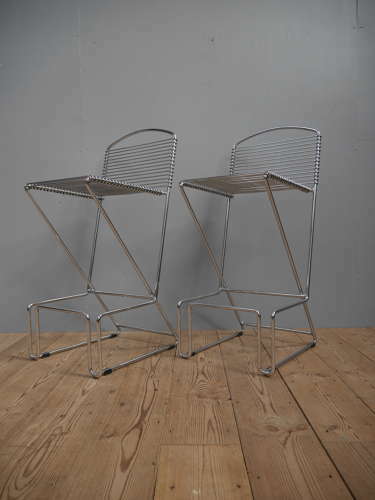 A handsome pair of stools of exceptional form, the unmistakable 20th century design in chromed steel & wire providing a slight cantilever action typical of Behrens. Timeless, sculptural, very stylish & would fit in anywhere. Wear commensurate with age, comparatively excellent examples showing a few minor signs of age. Collection in person preferred though a UK courier service can often be arranged at cost, please enquire for details.